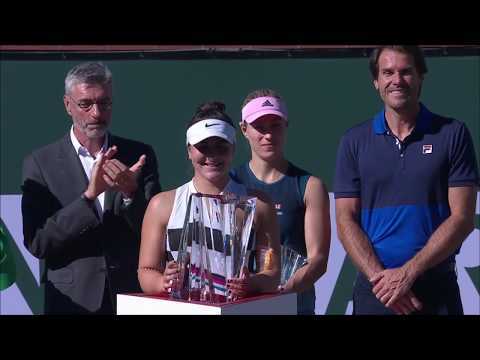 Gabriela Dabrowski and her Croatian partner Mate Pavic advanced to the French Open mixed doubles final with a 6-4, 6-4 victory over Katarina Srebotnik of Slovenia and Santiago Gonzalez of Mexico on Tuesday. As defending mixed doubles champion with Rohan Bopanna, Dabrowski will at least get a chance to defend her half of the 2017 title in Thursday’s final. It was a fairly normal mixed doubles match in that one break of the women’s serve – Srebotnik in the seventh game of both sets – sufficed to provide the margin of victory for Dabrowski and Pavic. But it was definitely abnormal mixed doubles from the Dabrowski/Pavic perspective. The 6-foot-4, left-handed Croat faced five breaks points – including a quadruple break point in the second game of the second set – while Dabrowski didn’t face a single break point on her serve the entire match. It was an impressive escape for Pavic from love-40 (there’s no-ad scoring in the mixed event so that makes it four break points) in that fourth game, especially considering that on three of the four he was serving to Gonzalez – and twice getting down to a second serve. Pavic is No. 1 in the ATP doubles rankings and won both the men’s doubles and mixed doubles at the Australian Open in January. Now he is in the men’s doubles semi-finals (with regular partner Oliver Marach of Austria) and the mixed final at Roland Garros. That means he’s unbeaten in 19 Grand Slam matches (10 in men’s doubles and nine in mixed) so far in 2018. Dabrowski, 26, is on a streak of her own having now won nine consecutive mixed doubles matches and finding herself in her second French Open mixed final in a row. A year ago in Paris she and Bopanna won the mixed with a 2-6, 6-2, [12-10] win over Anna-Lena Groenefeld of Germany and Robert Farah of Colombia. On Tuesday in Court No. 1 – the renowned ‘bullring’ stadium that will be demolished after this year’s tournament to create more space on an already overly-crowded site – Dabrowski may have played her best match in doubles and mixed doubles so far this year at Roland Garros. On Monday in women’s doubles, the fifth-seeded Dabrowski and partner Xu Yifan of China were upset 6-1, 6-2 by Eri Hozumi and Makoto Ninomiya of Japan. Both Dabrowski and Xu failed to convert 40-15 in their first two service games and the Japanese pair just took over from there. On Tuesday in the fourth game of the second set of the mixed doubles, there was a controversy when Pavic put away a shot but the umpire Louis Boucharinc of France ruled that he had touched the net with his foot and awarded the point to Srebotnik and Gonzalez. Pavic insisted he had not touched the net and remained in the same position right on top of the net with his foot planted not touching the net to show Boucharinc. But Boucharinc would not change his decision despite Pavic getting quite animated in protest. In the final, Dabrowski (putting away a high backhand volley above) and Pavic will play second seeds Latisha Chan of China and Ivan Dodig of Croatia or Groenefeld and Farah, the No. 8 seeds, who play on Court 18 on Wednesday not before 2 p.m. (8 a.m. ET in Canada). It would be interesting if Chan and Dodig reach the final because then both men – Dodig and Pavic – would be from Croatia. When Canada played its opening round of Davis Cup in Croatia in early February, Dodig played doubles with Marin Cilic and Pavic was not on the team. He has had an ongoing dispute with Croat Davis Cup captain Zeljko Krajan and his absence for the World Group tie was a hot topic among the Croatian media in Osijek, site of the tie. Playing in her first Grand Slam junior singles tournament, 15-year-old Leylah Annie Fernandez of Montreal advanced to the third round of the Roland Garros girls event on Tuesday with a 6-1, 7-6(4) victory over Kamilla Rakhimova of Russia. It was a quick first set but the 16-year-old Rakhimova tightened up her play in the second set and made the match more competitive. It was seriously rainy over night in Paris and carried on well into Tuesday morning. The Fernandez – Rakhimova match still managed to start on time at 11 a.m. on Court 15. There was one odd moment in the match at 4-4, 15-all in the second set with Fernandez serving. She hit a first serve and it dribbled over the net and the umpire called 30-15, meaning she had won the point. They aren’t playing ‘let’ serves in the junior event. And sometimes it’s hard for some players to adjust. “I thought I’d missed my serve but it went in so it was good,” Fernandez smiled. About Paris, Fernandez said, “it’s my first time here. It’s a very beautiful city and I’m really happy to be here. I hope I’ll be able to visit a bit more at the end of the week. Not sure why Canadians in Paris would want to go a Canadian sports bar called The Moose – Bar & Grill. But possibly it could be a nice place to visit as a change of pace – and for some Canadian beer. The Moose is located on avenue des quatres vents (avenue of the four winds) in Paris 6ieme.